This is it, today is the last day of the Lettering Delights Dollar Days sale! So don't forget to grab the sets you've been eyeing, before the prices go back to normal. Plus, if you use the coupon code Royalty, you'll receive $10 off any $25 or more orders. Click here or on the ad in the right hand column to start shopping. As well, please don't forget to vote in the poll I posted yesterday, to choose which project you'd like me to demonstrate during the Make the Cut! Blog Hop in May. And finallly, since it looks like the snow might finally be disappearing for good where we are, and spring flowers are starting to appear, here's a little watering can for all your spring projects. Just click on the preview image to download the files. As always, MTC, SVG and now PDF files are included in the free download. Enjoy! Thank you so much for this post. I want to let you know that I posted a link to your blog in Creative Busy Hands Cricut Freebies Search List, under the Elements post on Apr. 28, 2011. Thanks again. 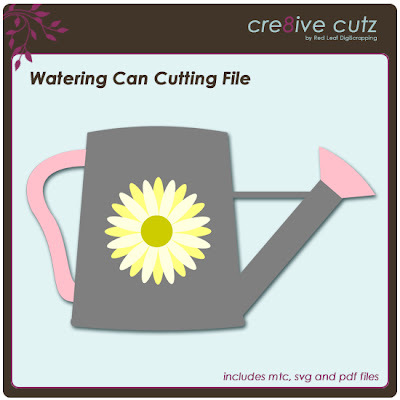 Thanks fo rthis very cute watering can file. Thank you for the cute file!